The eKo Pro Series Monitoring and Control System provides support for numerous sensors including soil moisture, soil water content, soil temp, solar radiation canopy temperature, barometric pressure, wind speed, wind direction, rain, humidity and leaf wetness monitoring for viticulture and agriculture in general. eKo Pro also provides the ability to take action based on the data. The system includes an actuation interface which can be connected to operate solenoid valves or pump relays. 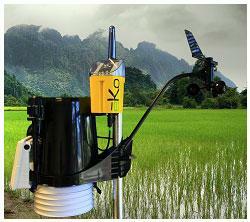 The eKo Pro weather proof, solar powered sensing stations are capable of monitoring many parameters/station. Measurements are made every 15 minutes and relayed back to a gateway/webserver with database where the data is immediately available via the internet. The gateway shown at right is a full function Intel Atom D510 based dual core processor which supports four 64 bit threads at 1.8GHz. It has a 250GB hard drive, 1GB of RAM, 4 USB ports and runs industry standard Apache2 webserver under Linux Ubuntu 10.04LTS. With a mouse, keybard and VGA display attached it can be used as a workstation for viewing the data with a browser. This third generation gateway developed by Camalie Networks provides very fast data viewing response and never misses a data packet or actuation. Each field station has 4 ports which can each receive a sensor or sensor set connection. The weather station at right uses just one port. Sensor typesare automatically identified by the station units requiring no user configuration. The weather station measures rainfall, solar radiation, wind, temperature, humidity and barometric pressure. The weather station hardware is 10 year field tested Davis hardware with an eKo Pro interface. It's built to last and spare parts are readily available. The sensing stations are network nodes which use Crossbow's self organizing mesh technology to transmit and relay data packets back to the system's gateway/webserver. Data is available via a dashbord, map, trend graphs e-mail or cellular text message alerts in real time all via the internet. The self organizing mesh automatically forms a daisy chain of stations to relay data packets long distances and allow easy scaling to more than 50 stations and several mile range. The mesh firmware organizes new routes as stations are added with no user intervention or reconfiguration whatsoever. The network uses the 2.4GHz band and does not require an RF license or cellular subscription costs. Coverage of remote valleys via ridgetop hops. No regular maintenance except backup, and no satellite or cellular subscription required. Last modified: 5/9/12 Note on pronunciation: Camalie rhymes with "family"